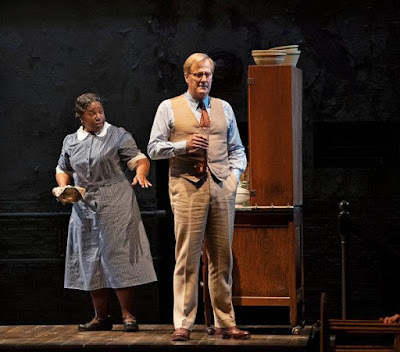 Review of the Sunday, January 13, 2019 matinee performance at the Sam S. Shubert Theatre in New York City. 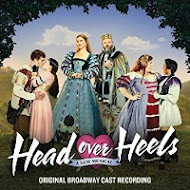 Starring Jeff Daniels, Celia Keenan-Bolger, Will Pullen, Gideon Glick, Frederick Weller, Gbenga Akinnagbe, Stark Sands, Dakin Matthews, Erin Wilhelmi and LaTanya Richardson Jackson. A New Play by Aaron Sorkin. Scenic design by Miriam Buether. Costume design by Ann Roth. Lighting design by Jennifer Tipton. Sound design by Scott Lehrer. Original music by Adam Guettel. Directed by Bartlett Sher. 2 hours, 35 minutes, including one intermission. 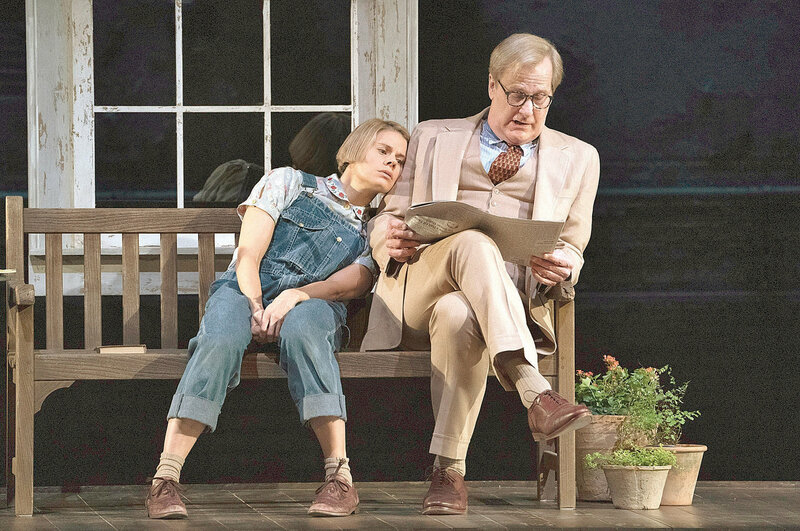 Harper Lee's To Kill a Mockingbird is a masterpiece of literature, a masterpiece of film-making, and now, under the power of playwright Aaron Sorkin and director Bartlett Sher, it is a masterpiece of theatricality. The beauty of this piece is that it reveals the material to be both timeless and timely. 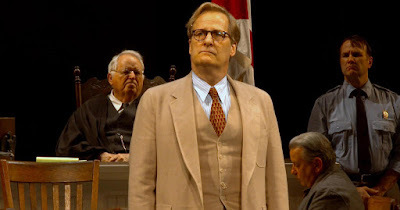 That it does so as a memory play and courtroom drama only serves as a stark reminder that history seems to be repeating itself over and over again. That it does so with a heady mix of vicious, inflammatory language and a surprising amount of humor and moral heart (sans didactic preaching) makes it remarkably entertaining and gripping. There is something so quaint and so American about the way this play is presented from the barn red wooden wall that separates us from the action to the set pieces that slide in and out or are pushed into place by the company. Miriam Buether's dreamlike suggestive design is grounded by specific pieces that the mind will recall years later (a specific phone on a specific hall table on a nondescript platform, for example) and represents the pillars of American culture: the single-family home, complete with front porch, and that great institution, a courtroom. Oh, and a prison. Similarly, Ann Roth's nostalgic costumes hit just the right notes of familiarity and striking specificity (generic overalls and cotton dresses versus frightening KKK hoods made from sacks and pillowcases), while Jennifer Tipton's amber tinged lighting at times makes it feel as though we are seeing everything through a sepia toned haze, and at others with a harsh revealing light (the scenes on the Finch porch vs the scenes in the courtroom). Sher's deft direction fully embraces this dichotomy, with his narrators circling the action, directly addressing us, and at other times interjecting themselves into the story. This allows the play to be both a memory and a "happening in the present" situation. There are other wonderful touches - the empty chairs in the jury box, the clever use of sliding panels to create an exciting chase scene, the entrances through the dark aisles by dangerous neighbors, the quiet but powerful segregation of the colored cast members... Every aspect of this production is so in sync. And that includes the cast. It speaks volumes (no pun intended) that the silent ensemble delivers equally riveting performances as the main cast. They are so much more than scenery movers and observers; they offer a master class in being "present" and maintaining specifically drawn members of the Maycomb, Alabama community. Others have small speaking roles that create dynamic moments that should galvanize everyone in the room. Case in point: Phyllis Sommerville's riveting portrayal of deep-seeded prejudice in the white upper crust in the person of the Finch's elderly neighbor. Then there's the insidious power that comes from hiding behind a hood and the disgrace of cowardice exposed when the hood comes off, poignantly played by Danny Wolohan. The disheartening and very disturbing blatant racism of the social hierarchy at play here is eerie in its bold portrayal, and scary in light of today's national climate. 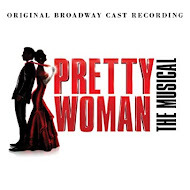 The bold pride in spewing such venom comes to vivid life in the brilliant hands of actors Frederick Weller and Erin Wilhelmi whose portrayals of the poor white uneducated accusers are so on point, one may fear for the safety of both once they leave the confines of the Shubert. Their speeches are true show pieces. Dakin Matthews' liberal leaning judge reminds me of a shot of Southern Comfort - a sharp delivery, followed by a slow burn and a final smooth smile. He's a delight. It was nice, too, to see a dramatic, unsympathetic side to Stark Sands' acting repertoire. Watching his character degrade another human being, red-faced and spitting mad is beyond uncomfortable, made all the more so by taking place in a courtroom. LaTanya Richardson Jackson, as the benevolent, tired Finch housekeeper, powerfully delivers a series of truth bombs in act two garnering some very cathartic applause from the moved audience. As defendant and symbol of racial injustice Tom Robinson, Gbenga Akinnagbe makes an award-worthy debut, wisely avoiding the scenery chewing route and letting the material do the heavy lifting. The way Sorkin has structured his play, there are three narrators offering commentary, sometimes observing, sometimes participating in the action. There's Dill, a new kid visiting for the summer - one that will change his life forever, played with heartbreaking sweetness and awkward intensity by the marvelous Gideon Glick. I was struck by the way he managed to seem part of family and isolated at the same time. Jem, the older brother with strong beliefs and an unbreakable protective instinct is played with a rough and tumble intensity by Will Pullen. He's the perfect foil for his new best friend and his little sister, and watching Pullen navigate the coming of age of the boy is fascinating. 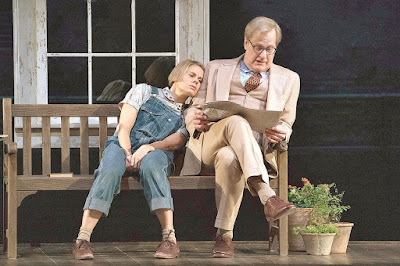 Then there's Scout, our chief narrator - and stand-in for Harper Lee - embodied by the absolutely brilliant Celia Keenan-Bolger in the role of her career to date. The physicality of her performance is astonishing, and her slow drawl line delivery is perfection. The look on her face at the end when she makes some of her first "adult" realizations is seared into my memory. All three are sublime. There is so much to admire in this beautiful production, from the source material to the adaptation, from the design to the direction, from the ensemble to the supporting cast. But To Kill a Mockingbird simply would not work without a perfect Atticus Finch. 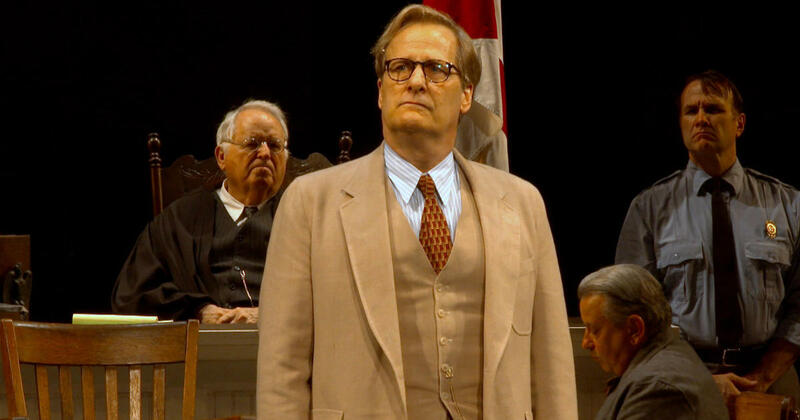 Jeff Daniels is just that. This is a quiet, humble, profoundly intense tour de force performance. Daniels nails the Southern charm and balances it perfectly with quiet liberalism and a fierce righteousness that is both fearsome and inspiring. This is a performance that people will talk about for years to come. This is a play people will talk about for years to come. Don't miss this one.